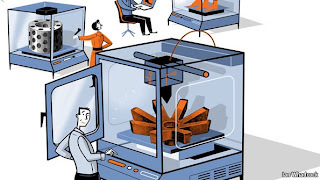 Additive Manufacturing, aka 3D Printing, will reach $3.1 billion worldwide by 2016 and $5.2 billion by 2020. In the 3D Printing and Additive Manufacturing world, you can’t go far without hearing the name: Terry Wohlers. He is the man who built Wohlers Associates with 25-plus years of studying, analyzing, and forecasting growth to give you those numbers above. Did you think 3D Printers and Rapid Prototyping were new? If so, you will want to read and study some of Mr. Wohlers’ work and legacy. He’s been deep in the industry for more than two decades, as mentioned above, and most people think this industry is only a few years old. Far from it. I read an excerpt of his 2011 report: Additive Manufacturing and 3D Printing State of the Industry Annual Worldwide Progress Report and then spoke with him by phone. In less than 30 minutes, I had more industry insights than I had gleaned across dozens of blogs and news sites. I find myself zipping over to Mr. Wohlers’ blog every other week to check out what new thing he’s uncovered or insight he shares. He does appear to be everywhere I look. When I started researching the very real 3D printed car called the Urbee (photo above), Mr. Wohlers was there already. His post onJim Kor and the Urbee is a good read if you’re into electric vehicles, energy efficient vehicles, and the hope for a vehicle for a sustainable future. By the way, the Urbee “uses electric motors and is capable of 200 mpg when running on an 8 hp ethanol-powered engine, which serves as a backup. The car is expected to reach 70 mph,” according to the blog post. The 3D-printed body was revealed at TEDxWinnipeg in September 2011. Here are just a few of the companies the report mentions or discusses that I think you’ll recognize: EOS, ExOne, Fab@Home, MakerBot Industries, Materialise, Objet, Optomec, ReaLizer, RepRap, Shapeways, Stratasys, and 3D Systems. He covers Australia, China, Europe, India, Israel, Japan, South Africa, and some other places you might not have known were active in 3D printing. The report looks at how existing industries are leveraging 3D Printing. For example, how are CAD models going mobile? What are the medical applications? He shares insights into the materials for medical modeling and how surgical models are evolving. The realities of 3D scanning and reverse engineering are explored and 3D-scanning applications that are coming up because of these needs. If you’re keen on understanding the world of 3D printing and its billion dollar future, head over to Wohlers Associates (report link is on the left side of the page) and keep me posted on what you learn. INSIDE A LOW-RISE building in a business park at Rock Hill, South Carolina, is a vision of the factory of the future. Several dozen machines are humming away, monitored from a glass-fronted control room by two people looking at computer screens. Some of the machines are the size of a car, others that of a microwave oven, but they all have windows that you can peer into. One is making jewellery, others are producing the plastic grip for an electric drill, the dashboard of a car, an intricate lampshade and a bespoke artificial leg. One is even making parts to build more machines like itself. This is the headquarters of 3D Systems, a firm founded by Chuck Hull, who in a 1986 patent described a system he had invented for making three-dimensional objects as “stereolithography”. It worked by using a beam of ultraviolet light to solidify a thin layer of liquid plastic, a bit like ink, and repeating the process by adding more liquid plastic. Other forms of 3D printing have since emerged (see article), but they all work as an additive process, building objects up layer by layer. 3D printing was originally conceived as a way to make one-off prototypes, but as the technology is getting better more things are being printed as finished goods (a process known as additive manufacturing). Currently around 28% of the money spent on printing things is for final products, according to Terry Wohlers, who runs a research firm specialising in the field. He predicts that this will rise to just over 50% by 2016 and to more than 80% by 2020. But it will never reach 100%, he thinks, because the ability to make prototypes quickly and cheaply will remain an important part of the mix. One-off prototypes can be hideously expensive to produce, but a 3D printer can bring down the cost by a huge margin. Lots of consumer goods, mechanical parts, shoes and architects’ models now appear in a 3D-printed form for appraisal by engineers, stylists and clients before getting the go-ahead. Any changes can be swiftly reprinted in a few hours or overnight, whereas waiting for a new prototype to emerge from a machine shop could take weeks. Some designers are already printing ready-to-wear shoes and dresses from plastic and nylon materials. Iris van Herpen, a Dutch fashion designer, has produced striking 3D-printed collections for the catwalks. No one can yet print leather, but they are working on it. As there are barely any economies of scale in additive manufacturing, the technology is ideally suited to low-volume production. It also allows the mass customisation of finished parts. Millions of dental crowns and shells for hearing aids are already being made individually with 3D printers. Freed of the constraints of traditional factories, additive manufacturing allows designers to produce things that were previously considered far too complex to make economically. That could be for aesthetic reasons, but engineers are finding practical applications too. For example, fluids flow more efficiently through rounded channels than they do around sharp corners, but it is very difficult to make such channels inside a solid metal structure by conventional means, whereas a 3D printer can do this easily. 3T RPD, a British firm that offers additive-manufacturing services, printed a gearbox for a racing car with smooth internal pathways for hydraulic oil instead of drilled-out right-angle bends. The box not only allows faster gear changes but is some 30% lighter, says Ian Halliday, the firm’s chief executive. A Boeing F-18 fighter contains a number of printed parts such as air ducts, for similar reasons. Weight savings are part of the attraction of 3D-printed parts. With objects being built up layer by layer, it is possible to use just enough material to make the part work. Building things in a traditional factory requires adding flanges and brackets so that objects can be handled, milled and moulded by machine tools, and to provide surfaces for the parts to be bolted or welded together. A 3D printer is likely to print the item as a complete part that requires no assembly. It can even make mechanical objects with moving parts in one go. This promises big savings in material costs. In the aerospace industry metal parts are often machined from a solid billet of costly high-grade titanium. This can mean that 90% of the material is cut away, and the swarf is of no use for making aircraft. However, titanium powder can be used to print things like a bracket for an aircraft door or part of a satellite. These can be as strong as a machined part but use only 10% of the raw material, according to researchers at EADS, the European aerospace consortium which is the parent of Airbus. The ability to produce highly complex designs with powerful computer software and turn them into real objects with 3D printing is creating a new design language. 3D-printed items often have an organic, natural look. “Nature has come up with some very efficient designs, and often it is a good idea to mimic them,” says Wim Michiels, vice-president of Materialise, a Belgian firm that uses additive manufacturing to make a range of products, including medical devices. By incorporating the fine, lattice-like internal structure of natural bone into a metal implant, for instance, it can be made lighter than a machined one without any loss of strength, integrate more easily with the patient’s own bones and can be crafted precisely to fit the intended patient. Last year surgeons in the Netherlands printed a new titanium jaw for a woman suffering from a chronic bone infection. Many companies are now wondering about the effect that additive manufacturing will have on their business. Some are taking the technology very seriously; GE, for one, is exploring how it might use 3D printing in all its operations. It already has one product in the pipeline, in the form of a small ultrasound scanner. Such scanners are used by doctors to produce an image of features inside the body, such as unborn babies. The size, weight and cost of the imaging consoles has shrunk, but the transducer probe which is placed on the body has remained largely unchanged and is now the most costly part of the system. The probe transmits pulses of high-frequency sound and receives signals back, using the reflections to produce images. It contains tiny piezoelectric structures that are made by painstakingly micro-machining a brittle block of ceramic material. Now GE has developed an additive system to print the transducer. This will greatly reduce production costs and allow new, inexpensive portable scanners to be developed, not only for medical use but also to inspect critical aerospace and industrial structures for cracks. How far could this technology go? Mr Idelchik, of GE Global Research, has his sights set high: “One day we will print an engine.” But a number of manufacturers, such as GE and Rolls-Royce, believe that some form of hybrid printing system will emerge. This would produce the outline of a shape, thus saving on material, which can then be machined for precision. The Replicator, a robotic rapid-manufacturing system made by Cybaman Technologies, a British firm, already gets close. The size of a large refrigerator, it is capable of both subtractive and additive manufacturing. It uses a laser-based deposition system to build a basic shape which is finished by machining. The Replicator, as befits its name, is also capable of reverse engineering by digitally scanning an object placed inside it to produce the data needed to build an exact replica. The Replicator is as near as current technology can get to the teleporter of science fiction. It could scan an object in one place and tell another machine on the other side of the world how to build a copy. That means, for instance, that urgently needed spares could be produced in remote places without having to ship anything. Even parts that are no longer available could be replicated, by scanning a broken item, repairing it virtually and then printing a new one. The chances are, though, that digital libraries will appear online for parts and products that are no longer available. Just as the emergence of e-books means books may never go out of print, components could always remain available. Service mechanics could have portable 3D printers in their vans, or hardware stores could offer part-printing services. 3D printers would also be invaluable in remote areas. Deon de Beer of Vaal University of Technology near Johannesburg is working on a project called the Idea 2 Product Lab which uses low-cost 3D printers for training and to spark an interest in design and manufacturing among students. When setting up a similar lab at one of the college’s satellite campuses at Upington, a largely rural area in the Northern Cape, his team found itself short of a particular type of flat spanner. Rather than waiting days for the correct tool to be delivered, it printed one and completed the job. Instead of a spanner this could have been a small plastic part, perhaps to fix a piece of equipment in a local hospital or to repair an agricultural machine, says Mr de Beer. He believes 3D printers could “produce a new breed of mechanical engineers”, especially in rural regions. Some people already have 3D printers at home. Industrial 3D-printing systems start at about $15,000 and go up to more than $1m, says Wohlers. But cheaper desktop machines are creating an entirely new market (see chart 5). This is made up of hobbyists, do-it-yourself enthusiasts, tinkerers, inventors, researchers and entrepreneurs. Some 3D-printing systems can be built from kits and use open-source software. 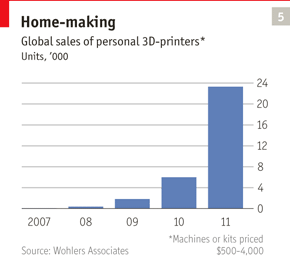 But big producers of 3D printers are also entering the market. 3D Systems, which produces a variety of prototyping and industrial machines, is now launching a consumer range of small 3D printers, called the Cube, which can make things like toys, chess pieces and ornaments. They have been developed along with an online platform called Cubify to provide services for a community of users. Priced at $1,299, the Cube prints by depositing a thin layer of material from cartridges, which come in different colours. This cures as a hard plastic. They can produce parts up to 5.5 inches (140mm) cubed at a typical cost in materials of about $3.50. The quality is not up to that of industrial printers, but it is good enough for many people. Higher-quality creations can be uploaded to Cubify’s online printing service. The new range is not just about printing things, says Abe Reichental, 3D Systems’ chief executive. 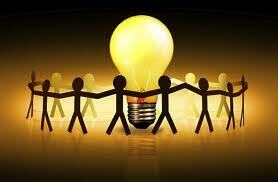 It is also about simplifying the process of making products and letting people use the power of the web to share ideas. “This is a personal manufacturing revolution,” he says. Brit Tech Genius: 10 Innovators Changing Your World. Think all your gadgets are dreamt up across the pond or in secret Far East bunkers owned by the world’s biggest tech titans? Think again. Britain is at the forefront when it comes to bleeding edge gadgetry, whether it’s the latest shiny must-have from Apple, or a motor that’s all set to break the land speed record. It’s easy to forget British boffins are behind some of the world’s greatest gadgets so, without further ado, here are my top 10 British innovators you need to know. Jonny Ive, Senior Vice President of Industrial Design at Apple:Every modern day Apple gadget owes its existence to one man. Not Steve Jobs, but Jonny Ive, the Chingford (UK) born designer who’s been in charge of Cupertino’s industrial design since 1997. In that time he’s created the classic iMac , turned the MP3 player from niche plaything to global phenomenon with the iPod , and made touchscreens work seamlessly on the iPhone. Ive’s a shy genius, rarely speaking about his work and showing his face in public even less often. He’s most frequently found toeing the company line in official Apple videos, but the clip below from American TV show Objectified shows him more relaxed, working in his studio, and explaining the thought processes which keeps him at the top of the tech design pile. James Dyson, inventor the Dyson Dual Cyclone: Dyson’s first vacuum cleaner, the G-Force, was sidelined when it was first unleashed in the 80s. Yet it’s follow-ups have set the tone for household gadgets all over the world. With the Dyson Dual Cyclone now found in the home of every self-respecting cleanliness freak Dyson has set his sights further afield.Not content with fighting dust, Dyson’s Airblade hand drier has called time on weak-willed air blowers in loos across the globe, and earlier this year he set out to change desktop fans forever with his Dyson Air Multiplier . Tim Berners Lee, inventor of the World Wide WebWithout Tim Berners Lee, what you’re doing right now might not be possible. The British engineer developed the www back in 1989, going on to build the first ever web browser and web server. After the first website was built in 1991, Berners Lee’s creation went from niche networking to global colossus in ten short years. Tell me you could live without the world wide web now and you’d be lying. John Piper, Chief Designer, Hound: You might not have heard of John Piper, but pay attention: Piper’s car, Hound, isn’t like other motors. That’s because it’s being primed to top 1,000mph in 2011, smashing the world land speed record in the process. Whizzing by in a faster-than-sound blur, it’ll be driven by current record holder, Wing Commander Andy Green. Piper recently finished the design of Hound, positioning a small rocket underneath the engine of a Eurofighter jet. He reckons it’ll be enough to bring him success with the landspeed record, and cements him a place on my list of British tech giants. Gordon Murray, McLaren F1 designer turned eco car maker: Murray is known as the man behind the McLaren F1 sports car. But he’s all set to make a name for himself at the bleeding edge of eco motoring with the T.27, a brand new type of electric car that’ll be ready to roll on British streets in just under two years. A completely new concept, Murray is hoping to have s built and on sale by 2011. It’ll have a top seed of 60mph when it hits the tarmac in 18 months time, weighing around half the mass of today’s ‘leccy motors at 600Kg. At the moment, Murray’s prototypes look like he’s hammered them together in a shed, but he’s got form for creating fantastic cars in the past, and could be about to start a Prius-style revolution right here in the UK. Trevor Baylis, inventor of the clockwork radio: Baylis is best known for inventing the clockwork radio, letting people snaffle signals without relying on batteries or the mains for their breakfast banter. His Freeplay radio, as it became known, was first unleashed in Africa, before a smaller hit the UK. Since then Baylis has become a champion of British inventors, helping young bucks bring their high tech dreams to reality with the Trevor Baylis Foundation. Kane Kramer, inventor of the Digital Audio Player: While Jonny Ive may have brought the MP3 player to the masses, it’s possible the iPod would never have happened without Kane Kramer. The British inventor first conceived a Digital Audio Player (DAP) back in 1979, also touting the idea of downloading music of your phone line and something that looks very much like an Apple store. It may have seemed mad back then, but he was bang on the money. Kramer’s original drawings of a DAP clearly show a slab like device that many of us would recognise as an iPod today. In 1979 though, his ideas were seen as marginal. Apple was even moved to recognise Kane’s idea in 2007, although it won’t be stumping up any cash in return for making it popular. Peter Molyneux, creator of Fable, Theme Park and Milo: Britain’s gaming industry is teeming with successful developers that are the envy of the world. But Molyneux has been a leading light in the world of video games since the 80s. Classics such as Theme Park, Populous and Fable all bear his hallmark. And he’s not shuffling off into retirement yet. Molyneux is one of the driving forces behind the Xbox 360’s Project Natal . At its launch, he showed off a project dubbed Milo and the forthcoming Fable 3. If a gaming technology has Molyneux behind it, you’re guaranteed big crowds, and with his vote firmly in Natal’s ballot box he’s already making sure British games studios are taking Microsoft’s system seriously. Richard Palmer, founder D3O: My home town 'Brighton and Hove' based 'D3O' is about to revolutionise gadgets. You might not know its name, but it’s one of the world’s first smart materials, and it was invented by a Brit! Sussex University graduate Chemical engineer Richard Palmerset up his own business to create the substance, which acts like silly putty in your hands, but stiffens up to absorb shocks and bumps whenever it’s hit. It’s a silicon polymer that has the look and feel of playdoh, and is already in laptop and iPod cases from Tech 21, saving your precious tech from taking a battering. Palmer also says it could go into body armour too. Think futuristic football shin pads that mould to your legs but harden up when you’re hit by a crunching tackle. Smart materials are the future, and Palmer proves you needn’t be a mega multinational to make your mark. Sir Howard Stringer, CEO Sony: Stringer hasn’t had it easy heading up one of the planet’s biggest tech giants. But his Sony United plan has made the gadget colossus more lean, better focused and able to make the most of its assets. His first triumph was with the robotic Rolly . The device itself was never going to be a huge seller, but it let Stringer pull together Sony’s Walkman, Aibo and mobile teams to create a single product that was more than the sum of its parts. It was niche and bizarre, and stole headlines while proving that Sony’s sprawling divisions could work together effectively. And he hasn’t stopped there. With the likes of the PlayStation 3’s XMB interface heading to Sony Ericsson phones and onto Blu-ray players, he’s helped Sony’s products have one core interface. The impending Sony Online Service , flogging eBooks, music and video will also be a huge match for iTunes, finally turning Sony’s ragtag army of products into a unified fighting force ready to stomp all over tech rivals. 12 Characteristics of Successful Internet Entrepreneurs. As long as there have been successful Internet entrepreneurs, there have been attempts to nail down what makes them successful. Whether it's a fellow entrepreneur looking for an edge or an interested layperson who is simply curious to know more, no shortage of people are dying to know how the Internet's business visionaries reached the top. These business success stories aren't the result of a secret formula; rather, each entrepreneur possesses a number of characteristics unique to their pursuits. Here's a rundown of 12 of these traits, the entrepreneurs who have them and the companies they helped create. The Trait: Determination. The Entrepreneur: Steve Jobs. The Company: Apple/NeXt/Pixar. Perhaps no Internet entrepreneur has exhibited more determination than late Steve Jobs. In his now famous speech at Stanford University's 2005 commencement, Jobs explained how he was thrown out of Apple in the mid 1980s by the board of directors. 'At age 30, I was out,' Jobs recalls - 'and very publicly out.' The life of an entrepreneur is rarely free from anxiety, but nothing compares to being ousted from the company you founded and watching others run it once it becomes a household name. The book 'iCon' reveals that Jobs apparently contemplated suicide following the crisis. While lesser businessmen would have crumbled, Jobs took his fall from grace as a challenge, starting two independently successful companies from scratch (NeXt and Pixar) and eventually returning to rescue Apple from the brink of failure, spearheading its current digital music and media-driven renaissance. Without the determination to remain in Silicon Valley, Jobs may never have returned to prominence or led Apple to the market dominance it enjoys today. The Trait: Innovation. The Entrepreneurs: Sergey Brin and Larry Page. The Company: Google. In John Battelle's book "The Search: How Google and Its Rivals Rewrote the Rules of Business", readers learn that Google co-founders Sergey Brin and Larry Page were not money-chasing businessmen, but hackers who truly wanted to build the best search technology in the world. Neither of them had any clue what practical applications any of their work would have when they maxed out their personal credit cards to buy servers and computer parts; they simply knew they were onto something and felt a burning desire to bring superior technology into being. Indeed, virtually every dominant search engine of the mid to late 1990s (Lycos, Alta Vista and Yahoo! to name a few) passed up the chance to buy Google before its breakout as the Internet juggernaut. It wasn't until the launch of Google AdWords that the company found any substantial or enduring way to capitalize on its mega-popular search engine, and that was just fine with Page and Brin. While they certainly wanted to get paid, innovation was always at the forefront and led to them getting their enormous payday. The Trait: Frugality. The Entrepreneur: Aaron Patzer. The Company: Mint. One of the biggest misconceptions about Internet business success is that you can't build a "real" company without fancy office space, mahogany furniture and slick corporate attire. Laying waste to this myth is Aaron Patzer, the founder of Mint.com and tireless advocate of frugality. Conceived as a way to painlessly connect consumers with money-saving deals and offer useful insight into their financial lives, Mint.com was itself a model of frugality, growing little by little and taking outside investment only when necessary to expand. This is a sharp contrast from many late 90s Internet businesses, which seemed to regard the business as an excuse for burning other people's money rather than a vehicle for producing its own. Patzer's frugality paid off when Mint was acquired by Intuit in 2009 for $170 million. The Trait: Experimentation. The Entrepreneur: Mark Zuckerberg. The Company: Facebook. Even successful entrepreneurs often find themselves settling into comfort zones and developing tunnel vision about their products or services. Rather than continuously striving to tweak and improve, they grow content with what works now, almost setting it on a pedestal that one fears to fiddle with in any major way. Perhaps no Internet businessman has spit in the face of this attitude more than Mark Zuckerberg. Despite Facebook's status as a social networking giant, Zuckerberg and Co. have never shied away from changing the user interface (sometimes in the face of protests) or shaking things up in the efforte to break new ground. Though not all of his changes have been successful, a surprising majority of them have stood the test of time and boosted Facebook's following. The Trait: Eccentricity. The Entrepreneur: Tim Ferris. The Company: FourHourWorkWeek.com. Read the biography of virtually any successful entrepreneur and you'll find that they might not act quite like the general population. This trait is known as eccentricity, and few contemporary Web entrepreneurs exemplify it more than Timothy Ferris. In his perennial best seller "The Four Hour Work Week," Ferris advocates cultivating a radically new mindset about work. Rather than seeing work as something to be begrudgingly endured for the sake of weekends and holidays, Ferris recommends molding work to the life you wish to live. Primarily, this consists of building systems to produce wealth without ongoing struggle and using the 80/20 principle to identify where your efforts produce the most and least results. Properly executed, such actions enable one to travel and live as one pleases while keeping work in its place. Ferris has utilized these eccentric behaviors to escape the 9-5 grind forever, both via book sales and his own online businesses. His story is a needed reminder that different outcomes require different behavior. Put another way, what got you here won't get you there. Engineers have an old saying that drives the field to this day: KISS, or "keep it simple, stupid." YouTube founders Chad Hurley, Steve Chen and Jawed Karim understood this better than most when they created a site that existed to do nothing more than let the average Joe upload his own videos. Without any delusions of grandeur or pretense about changing the world (which it has arguably done anyway), YouTube rose to Internet stardom by simply creating a cool, useful service that people would enjoy using daily. The fact that YouTube links are shared over IM, text, and Facebook all day long is a testament to the value of simplicity in business, and explains why Google snapped up the video sharing site for over $1 billion in 2007. No one has written more about Internet business success than Paul Graham, co-founder of seed capital firm Y Combinator. Before he invested in startups, Graham built and sold his own: Viaweb. It was during that time that Graham learned (and applied) the lesson he now preaches to new entrepreneurs: make stuff people want. Unlike so many far-fetched companies of the time, in 1995 Viaweb was focused on a single goal: enabling non-tech savvy individuals to build and run their own online stores. By zeroing in on a need for which there was very much obvious demand, Viaweb was virtually assured of being successful so long as it came up with elegant solutions to sell. It did, and was eventually acquired by Yahoo! in 1998 for around $45 million in stock. As an investor at Y Combinator and essayist at PaulGraham.com, Graham now advocates making sure your idea has demand before lifting a finger on development. Without this, he persuasively claims, all the bold press releases and product launches in the world wont save you. It might seem that iconoclastic is just another word for eccentric, but they are not actually the same. Eccentricity is simply violating behavioral norms. An iconoclast, however, generates conflict with his eccentricity by disrupting and changing the way things are done within entire industries or societies. In founding Kazaa and Skype, Swedish entrepreneur Niklas Zennstrom exhibited iconoclastic behavior par excellence. Widespread use of Kazaa's peer-to-peer technology helped put the nail in the coffin of tightly controlled and centralized media downloading, while Skype (despite a recent slowdown) stuck it to the telecoms by introducing P2P telephony. His latest venture, Joost, is attempting to revolutionize online video in much the same way. It hasn't always been easy for Zennstrom (who stayed out of the US for years to avoid lawsuits from record companies during Kazaa's heyday) but in true iconoclastic fashion, he has never seen this as a reason to stop or slow down. The most talked-about Internet entrepreneurs have almost superhuman ambition. Not content to merely have a nice little business, these titans of Web industry set their sights on building epic enterprises that become part of history itself. Surely Jeff Bezos displayed ambition in founding Amazon.com, a Web portal that retails virtually any book, video game, or consumer electronic a buyer could wish to find. It took awhile for Amazon to become profitable with such a wide focus, but today it is one of the most celebrated Internet companies, and with recent product launches like the Kindle e-book reader, it figures to remain a dominant force for years to come. The Trait: Focus. The Entrepreneur: Max Levchin. The Company: PayPal. Even prosperous businesses can be dragged under by failure to address their biggest problems head-on. When Max Levchin (above right) founded PayPal, it would have been very easy for him to neglect the rampant fraud that threatened to suffocate the company's profit margins, turning his attention instead to how great it was that PayPal was growing at a phenomenal rate. Instead, Levchin utilized the timeless entrepreneurial characteristic of focus, making security priority number one at the fledgling online payment service. Within a couple of years, according to Jessica Livingston's excellent book Founders at Work, fraud was largely reigned in at PayPal and the company was acquired by ebay for $1.5 billion in 2002. The lesson here is to confront (rather than rationalize away) your company's biggest problems, no matter how well the rest of the business may be doing. Some of the biggest Internet fortunes have their origins in shrewd opportunism like that displayed by Tom Anderson. In founding MySpace, Anderson saw a gap between what social networking users wished to do and what inferior Web sites like Friendster allowed them to do, such as simplified photo uploading, graphical customization and music sharing. Upon amassing over 500 million registered users, MySpace was acquired by media empire News Corp. for $580 million (a figure that now appears to be a bargain in light of what YouTube recieved and what has been offered for competitor Facebook). While many have criticized MySpace for being too "messy" or "unprofessional", Anderson's genius was in recognizing that this was irrelevant to his target audience of teenagers, singles and musicians who simply wanted an outlet to set up their pages however they wanted. Paul Graham put it well when he said that some goals (like winning an Olympic medal) require unswavering dedication to a fixed plan while startups are more like science, where you need to follow the trail wherever it leads. A shining example of this trait - flexibility - is Wikipedia founder Jimmy Wales. As a completly member-driven, collaborative online encyclopedia, Wikipedia has grown in a myriad directions, usually at the prompting of users rather than sweeping declarations from Wales or his team. The result has been a robust and ever-improving resource shaped by those who use it rather than those who wish to tell users what they "should" use. New Internet entrepreneurs would do well to learn a thing or two about flexibility from Wales, even if their business is not explicitly collaborative a la Wikipedia.